Folk Names; Casse Lunette and Red Eye Bright. Magickal Powers; Truth Magick, Psychic and Mental Powers. Eyebright can be used as incense for drawing on psychic and mental powers. Used in as added to the spells you are working for psychic magick and vision. Brewed into teas it will ingress the sight from your psychic visions and from scrying. Burned or brewed will aid to clearing the mind and refreshing your memory. Medical Uses; Eye Infections and Brightener, Astringent, Antiseptic, Allergies, Sinusitis and Hay Fever. 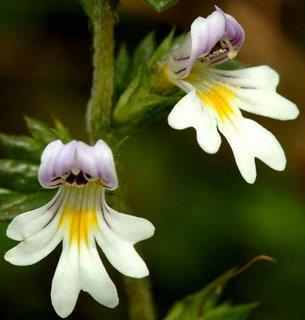 Eyebright may be best known for the infusions made from the whole plant or oils to treat eye problems. Infusion of Eyebright are made into washes are used by soaking a cloth in the liquid and covering the eyes to allow them to rest and will in addition remove the red for your eyes. These washes will in also add a clear sparkle to your eyes. The naturally mild astringent and antiseptic reduces inflammation from irritated eyes, as will as reduces the runny noses due to allergies, sinusitis and hay fever. Other; Some use the flowering tops in herbal cigarette for both the magickal and medical affects. All rights reserved under the US copyright laws and statues. Copyright © 12312011. * Because we have to: The Don’t be Stupid Clause or Disclaimer … If you are allergic to this herb don’t use it.